Davenport, of Blairsville, GA, started on the pole for the event and never looked back. Despite two cautions, the driver of the No.49 owned by Lance Landers was never seriously challenged for the lead spot. Chris Madden of Gray Court, SC was the only driver to reach the bumper of Davenport throughout the race. “It rubbered up so catching somebody and passing them is a different thing to do here,” said Madden. “We had a good car once we went low in one and two but I didn’t even realize it until two [laps] to go so I dove down there and I was able to carry some speed off the corner there. Clanton and Madden swapped for second and third once throughout the race but the Georgia Bulldog was only able to hold on to the spot for two laps before the No. 44 Barry Wright House Car reclaimed the position for the remainder of the race. The DIRTcar Late Models return to the track on February 13 for their second and final night of competition during the 12-day short track event before the World of Outlaws Craftsman Late Model Series takes center stage on Feb. 14-17. 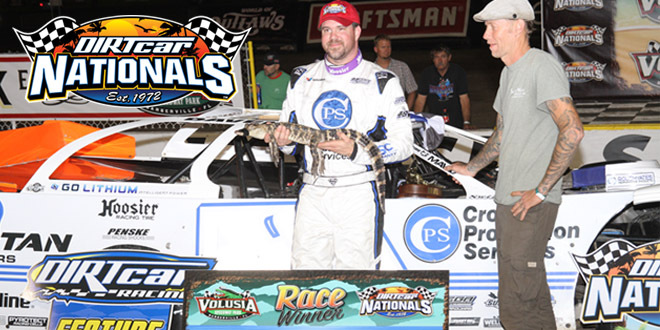 The DIRTcar Racing Modifieds completed a seven-night stretch of DIRTcar Nationals competition concluding with the crowning of the Big Gator Champion, Nick Hoffman. The entire Modified event took place before the Late Models hit the track for hot laps because of the threat of rain. Donny Schatz won the Sprint Car Big Gator Championship and Nick Hoffman won the Modified Big Gator Championship. Both drivers entered into Late Model competition. Heat 1: 1.44-Chris Madden; 2. 40B-Kyle Bronson; 3. 7-Rick Eckert; 4. 72-Mike Norris; 5. OF1-Coleby Frye; 6. 7mm-Michael Maresca; 7. 1star-Chub Frank; 8. 14z-Zack McMillan; 9. 22s-Brian Shirley; 10. 84-Austin Smith. Heat 4: 1. 54-David Breazeale; 2. 157-Mike Marlar; 3. C8-Timothy Culp; 4. 116-Brandon Overton; 5. B1-Brent Larson; 6. 2-Nick Hoffman; 7. 6-Blake Spencer; 8. 27-Jeff Beyers; 9. 115-Trey Beene; 10. 14r-Reid Millard.